Bending, Twisting, Cutting, and Cracking | Tennessee Aircraft Services, Inc. Since the first news of the cracked 210 spar caps came up from Australia early in 2012, Cessna has been hard at work investigating possible cause and appropriate action. The FAA issued AD 2012-10-04 well over a year ago. It was published as a first response to ensure none of our cantilever winged 210s would fall out of the sky and requires a one time inspection of the wing lower spar cap when the airframe reaches 5000 hours total time. Obviously, a one time inspection for a structural stress related failure is not a long term solution. Cessna has now published their current response in the form of Service Letter SEL-57-01 revision 2. Cessna’s original response was Service Letter SEL-57-01 issued April 27, 2012 which called for an immediate visual inspection, then recurring visual inspections every 100 hours or 12 months. This was a fairly hasty response on Cessna’s part due to minimal information on failures, none of which occurred in the United States. Of course, most all the people involved with the 210 design and production have retired or moved on, so much of the tribal knowledge was gone as well. Cessna began work to collect information on the strengths and weaknesses of the 210 wing structure. By the end of 2012, Cessna had stress gauges installed on a flying 210 to collect specific flight load data. Once that was achieved, they planned to apply the newly gained knowledge into a test regime on a spar at their test facility in hangar T40 in Wichita. To do that, they needed a subject spar without the rest of the airplane attached. That’s when I received a call to find out if I might have a spare 210 wing laying around. I was happy to give Cessna pick of any of the 40+ core 210 wings in our inventory. As a thank you, I was invited to check in on the testing progress from time to time and even be present when they performed the final test. My first trip to see the spar testing was in June of 2013. I was escorted into building T40 to find the stripped down inboard section of my wing spar mounted in a giant Erector Set of steel beams and hydraulic rams. It reminded me of the medieval torture racks I’d seen in the movies. As a matter of fact, the entire building’s purpose was to perform terrible things to airframes to determine weak points, failure points, ultimate load tests, fatigue life, and strong points. The 210 spar had been reduced to just the web, caps, and straps of the inboard eight feet or so. The unique asymmetrical design of the spar cap flanges required that special guides be built to prevent the spar from twisting during the bending process. I’m sure there were many hours of meetings between the engineers to determine what tests should be performed and why. Of course, I wasn’t privy to any of those, but during my second visit to T40 in mid-December 2013, the Cessna engineers were very open with what all they had done. I was impressed at how much energy had been put into these 27 to 46 year old wings. One objective was to determine crack growth rates by applying large bending loads to the spar . The spar was not particularly cooperative as far as starting a crack. Eventually, at the highest stress point, a cut was made in the aft flange of the lower spar cap into one of the rivet holes. This is of the rivet holes where the leading edge skin and lower trailing edge skin overlap and attach to the spar. A 0.050” “flaw” was created in the spar cap at the rivet hole using electrical discharge machining (EDM). After many tens of thousands of bending repetitions, a small “natural” crack grew up to 0.100” long. The crack needed to grow very slow to keep the area at the leading tip of the crack from becoming too fluid. Preparation was complete and the part was ready to be pulled apart in one final big pull. The spar assembly in the fixture for the many thousands of bends to create the natural crack. 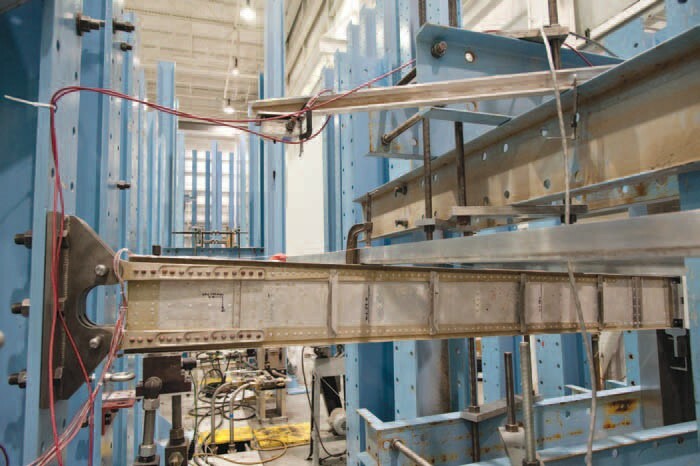 Cessna engineering had everything set up to perform a residual static strength test on the spar cap in early December 2013. They called to ask if I’d like to attend the final test, and, of course, I packed a bag and made my way to Wichita. The plan was for everyone, including the FAA to attend the event on Dec 13th at the lab in T40. When we got to the lab there were twelve people in attendance, mostly Cessna engineering, the FAA and me. I tried to keep quiet and look as smart as possible so I wouldn’t be quite so obvious. It didn’t last long as a severe case of curiosity eventually got the best of me. Everyone at Cessna was very willing to help educate me on the processes used and reasons for them. A small section of the spar cap about two feet long was bolted into a machine that would apply thousands of pounds of tension. There was a video camera on each side set to record anything visible and one camera focused on the computer screen as a backup to record the data. We all stood behind protective windows for viewing from relative safety just in case parts took flight. A section of the lower spar cap bolted into a machine that will try to pull it apart. The FAA test regulation for a strength test is to apply a limit load to the part. The tension was increased from zero to limit load over a thirty second span then held there for three seconds. The part appeared to pass that test with flying colors. 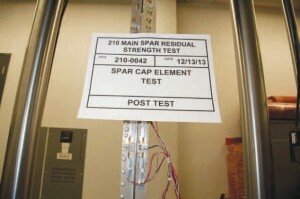 I don’t think anyone was surprised that the spar cap met the minimum test requirement. But Cessna wanted to know more about this legacy designed wing while they had the part in the test jig. As planned, the torture continued towards an ultimate residual load value. Unfortunately, the load frame stopped before the planned limit was reached. The test article was longer than the typical part which allowed it to stretch past the maximum programed movement of the machine before reaching the full planned test load. The part still managed to get to 92% of the intended maximum load before the test dumped. The crack was measured after the test and found to have grown by another 0.180”. The crack growth was not long enough to reach the radius of the flange. To get a “flawed” part to 92% of a maximum load expected for a perfect part, and have no failure, is pretty reassuring. A closer view showing the test gauges applied. The crack is on the left side of the part at the open rivet hole. Back in the day when the 210 structure was designed, the industry norm and regulations only required evaluating structures for static strength. Building for long term durability was accounted for by the experience of the designers. Not much testing was performed on test articles, although the factory did do some evaluations on in service airplanes. Damage tolerance assessments were also not required. From the initial news of the cracked spar caps found in Australia, I believed fatigue testing was in order to determine the life expectancy of the 210 wing structure. When Cessna asked for a wing, I assumed this was their objective. To the Cessna engineers, fatigue testing would determine when a crack is likely to start in a serviceable part due to cyclic loading. Damage tolerance attempts to determine at what rate a flaw will grow due to cyclic loading. Damage tolerance also helps define the amount of residual strength that remains in a part when a large flaw exists. None of the bending loads applied to this point were specifically designed to mimic flight loads as I had expected. What Cessna wanted to know was how much residual strength would a cracked spar cap have and would it be enough to prevent a total failure under limit flight loads. In my way of thinking on an in service wing, if a crack started between inspections, would the spar be strong enough to stay together until presumed crack discovery at the next scheduled inspection? The new revision of the bulletin gives initial inspection times which vary depending on the historical typical usage of the plane. It’s doubtful that many owners have any idea about how their plane was used in the past, so they might choose the lower time recommended for severe usage aircraft as a precaution. 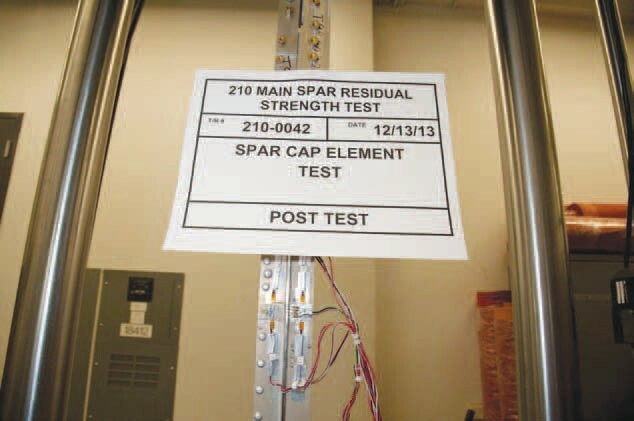 There are also different inspection times based on the material used in the spar caps. From the first cantilever 210 in 1967 through the 1984 210N series, 2014 Aluminum was used. The R models, which began in 1985, used 7075 aluminum. Every aluminum alloy has specific properties. Some are strong but don’t resist corrosion, others may have lower ultimate strength but hold up well to cyclic loads. The lower recurring inspection intervals for the 7075 seem to indicate engineering has more concern about its ability to hold up under long term cyclic loads. In previous versions of the bulletin, Eddy Current testing was only called for if visual inspection showed indications of cracks. The current version calls for hard time Eddy Current testing regardless of visual inspection results. It’s not often an AD is issued for primary wing structural issues. There is some controversy about how suddenly it was issued as well as the information surrounding the airplanes that had the damaged spar caps. The FAA was suddenly given information from CASA, the Australian aviation authorities about these planes and determined that quick action must be taken. I suspect the 5000 hour one time inspection was designed as an inexpensive way to secure the current fleet and give time for further investigation. The powers that be at Cessna expended a great deal of resources pursuing this issue. Before torturing my wing, they flew a test subject plane with many strain gauges and other data recording devices to determine the possible hot spots of concern. The resulting changes to their service bulletin suggest they found enough information to support keeping these old planes in service. 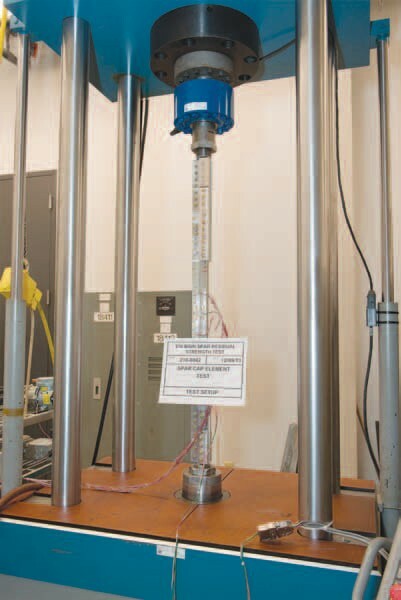 Some in the industry believe the Eddy Current tests are more expense than is needed. A dye penetrant crack detection would be more readily available, far less costly and possibly sufficient to the task. The FAAs presence at the final test was evidence to me that they’ll be spending some time reviewing all of Cessna’s findings. I’ve not heard anything directly from the FAA on the subject but we might as well prepare ourselves for a revision to the current AD. Hopefully, the FAA feels the scope of the current AD allows ample time for the community to respond to any forthcoming Notice of Proposed Rule Making.